Whether you’re growing plants or have an obsession with flashlights, you will encounter the terms candela, lux and lumens. These all refer to measuring light, but what’s the difference? Let’s start from the beginning. Light is composed of photons, which have a specific energy depending on the wavelength. The radiant flux is simply the amount of light energy being emitted per second. So the units for this is joules per second, also known as a watt. However, radiant flux doesn’t take into account the sensitivity of the human eye to certain wavelengths. To account for this, the power of each wavelength being emitted is weighted with a luminosity function, which models the sensitivity of the human eye. The unit for wavelength-weighted power is called the lumen. A lumen is the total power emitted by a light source, weighted by the sensitivity of the human eye to certain wavelengths. Example: The human eye is most sensitive to greenish-yellow light at 555 nm wavelength. So if we had a single green (555nm) LED and a single red (650nm) LED emitting 1 watt of radiant flux, the green LED would actually have a higher lumen value than the red LED. Factoring in the sensitivity profile of the human eye has implications. This means luminous flux and the lumen are meant to measure light as perceived by humans, which makes it a unit more useful whenever humans are involved. This is great for light bulbs and flashlights, but that means it’s less than ideal for non-human applications, like grow lights for plants. Luminous flux and the lumen take into account the wavelength(s) of light being emitted, but they don’t account for the direction. So the next step is measuring light in a certain direction. If we lived in 2 dimensions, this would be radians or degrees, but since we live in 3 dimensions, we use the unit for solid angles, which is a steradian (just like how there are 360 degrees or 2π radians in a circle, there are 4π steradians in a sphere). So luminous intensity measures how much light power (lumens) is concentrated into a solid angle. This unit is called the candela: lumens per steradian. Example: A light source putting out 2 lumens is focused so all its light is in a 1 steradian beam. This luminous intensity of the light beam is 2 candelas. Now, the beam is focused into a tighter, 0.5 steradian beam. The light source isn’t putting out any more or less power, but the light was focused into a more intense beam, so the light beam is now 4 candelas. A candela is a lumen per steradian (solid angle). A common candle has luminous intensity of roughly 1 candela. I found this confusing, because candles emit light in (almost) all directions, like a sphere. Since there are 4π steradians in a sphere, the total human-visible light output of the candle is roughly 4π lumens, or about 12.57 lumens. You may have heard of candlepower – it’s an obsolete unit of luminous intensity equal to 0.981 candelas. 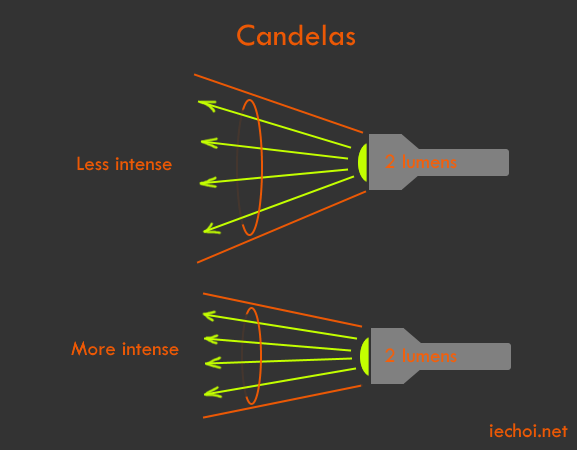 We just went over how a candela is a lumen per solid angle. Lux is a similar unit that measures lumens per area. Instead of lumens per steradian, lux is lumens per square meter. When you’re measuring the amount of light hitting a surface, it’s called illuminance; if you’re measuring the amount of light coming from a surface, it’s called luminous emittance. Illuminance is sometimes called “brightness”, but that term can have multiple meanings. Example: You have 2 identical flashlights that each emit 2 lumens in a 10° angle. If you pointed one of the flashlights at a wall 1 meter away, and the other flashlight at a wall 10 meters away, the patch of wall illuminated by the first flashlight has a greater illuminance (higher lux) than the patch of wall illuminated by the second flashlight. That is, both flashlights have the same luminous flux and luminous intensities, but one patch of wall is “brighter” than the other one. A lux is a lumen per square meter. Lumens, candela and lux are great for human applications, but in the world of hydroponics and grow lights, they’re pretty useless. Red and blue wavelengths drive plant growth, and green light is pretty much wasted on plants. When you’re buying or building an LED grow light, the spec sheet should specify radiant flux in watts (or radiant intensity in watts per steradian). Lumens are meaningless in the context of grow lights unless you know the emission spectrum of the lights in your comparison. Lumens and watts can be thought of the as the raw number of photons being pumped out by the light source, but lumens take into account the sensitivity of the human eye. Candelas take direction (i.e. “tightness of the beam”) into account (lumens per steradian), and so measures the luminous intensity. 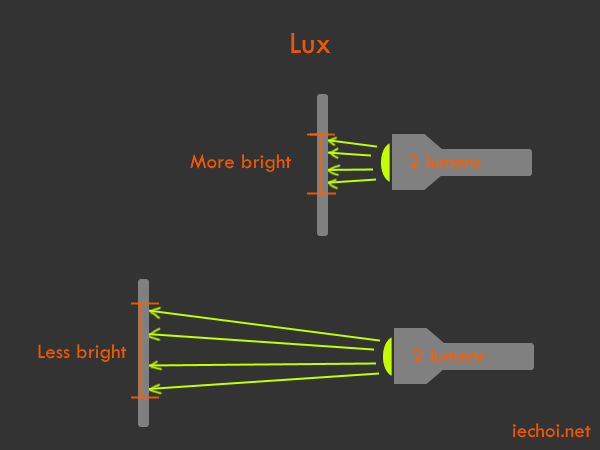 Lux takes area into account (lumens per square meter), and so measures the illuminance or “brightness” of an area.